There are certain herbs that keep popping up in mythology and historical texts. Lemon Balm, often just referred to as Balm, is one of these. The scientific name, Melissa officinalis, actually comes from Greek mythology. A nymph, named Melissa, had a tendency to share the secretes, and many uses, of honey with everyone she met. This made her especially sacred to bees, beekeepers, and anyone who used honey (bakers, doctors, etc). Since Lemon Balm's flowers are known to attract bees, especially honey bees, the name Melissa was used for this lemon-flavored member of the mint family. 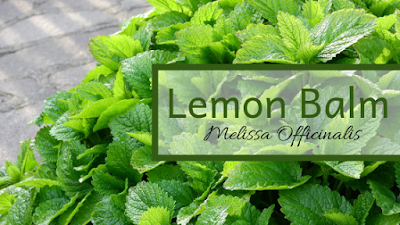 Since Lemon Balm has a very lemony flavor, it makes a great herb to add to your culinary experiments. I like the fresh leaves in a salad, or used to season my chicken. You can also use it to infuse vinegar, make a refreshing herb butter, or even add a few leaves to your tea. It's so versatile and tasty that you can really use it in just about any recipe, savory or sweet. Summary of actions- Antibacterial, antioxidant, antiviral, antispasmodic, aromatic, carminative, cerebral stimulant, diaphoretic, digestive, emmenagogue, febrifuge, nervous restorative, tonic, spasmolydic, and sedative (mild). Stress Management- Lemon Balm has been used, for centuries, to help calm the mind while not making one drowsy. Many people have reported that just smelling the plant or essential oil has a calming, stress relieving, effect. The Cardiovascular System- Lemon Balm helps reduce stress in the whole body, which helps to reduce the amount of stress put on the cardiovascular system. Not only that, but it also helps to protect the heart in many ways. Just inhaling the essential oil lowers high triglycerides and improves cholesterol synthesis in the liver, reducing the amount of cholesterol that gets stuck in the arteries. After consuming Lemon Balm on a regular basis, one's heart has a better resistance to injury. This herb also helps reduce heart palpitations and regulate arrhythmia (the heart beating at irregular rhythms). Improve Sleep- This herb supports a restful sleep. While it doesn't make one drowsy, it does help with relaxation, helping to shut off the mind when the body is ready for sleep. Lemon Balm is useful for all ages, it can even be used for infants and breastfeeding mothers, and has been reported to help all ages get better sleep. Skin- Lemon Balm has been used by women throughout the ages, to help reduce and soften wrinkles. This practice can be recorded as far back as the 14th century in Hungary, where the Queen herself used it to bring a more youthful appearance to her face. Today it is used to reduce fine lines, and help prevent lip blemishes. Improve Memory and Problem Solving- Lemon Balm does help calm the body and mind alike, but it does so without causing drowsiness. In many cases, it's even been shown to boost alertness. But it also helps to stimulate the memory. It also has been the subject of several studies that have shown it to help increase a person's ability to solve complex problems, regardless of age. After quite a bit of testing, it's been determined that Lemon Balm contains quite a number of compounds that help prevent the breakdown of neurotransmitters, helping the brain to communicate more efficiently and promoting healthy aging of the brain. Liver Support- Lemon Balm also helps to support healthy liver function. Helping to protect the liver from some of the negative effects of an unhealthy diet and improving cholesterol synthesis. Antibacterial- The natural antibacterial properties found in Lemon Balm make it great to use on wounds, in soaps, shampoos, hand sanitizers, and for cleaning products around the house. It also helps to control the growth of candida, a yeast naturally found in the gut, but when overgrown, can cause some serious problems. Diabetes- Quite a few studies have shown that Lemon Balm can help reduce blood sugar levels and reduce the oxidative stress related specifically to diabetes. Overactive Thyroid- Lemon Balm is fairly effective at controlling an overactive thyroid. This is particularly effective for those with Graves disease. Digestion- Lemon Balm helps to prevent the formation of gastric ulcers. It also helps to soothe the stomach and improve digestion. PMS Symptoms- Quite a few of the symptoms associated with PMS in most women are exacerbated by stress. Lemon Balm's stress relieving capabilities help to even out those PMS symptoms. It's especially shown to be effective for teenagers. Contraindications, Cautions, and Warnings- Lemon Balm is not recommended for people who have a low functioning thyroid. If you suspect that you have a thyroid problem, please consult your doctor. Also, pregnant and nursing mothers should use caution when using this herb, it's mostly considered safe, but there can be some interactions. I only included a basic introduction to this amazing herb. I hope you have learned a new appreciation for how amazing lemon balm is. If you have any questions or comments, please leave them below.